Competitive gaming has existed almost as long as videogames have themselves. Over recent years, however, eSports has exploded in popularity to become the mainstream spectator sport that it is today. 2016 was a huge year for eSports and 2017 shows no signs of its growth slowing. With a predicted year-on-year economic growth of 41.3% to $696 million (eSports Market Report, 2017), there are plenty of opportunities for firms to tap into this lucrative market. This growth is partly thanks to games like Call of Duty, League of Legends, CS:GO, Super Smash Bros. and Overwatch supporting strong competitive scenes for both solo and team play. Large player bases, sponsorship deals and the support from game developers has helped to create the perfect ecosystem for its army of players, spectators and commentators to thrive. With the rise of live streaming services (through providers such as Twitch and YouTube), accessibility to eSports has never been easier. 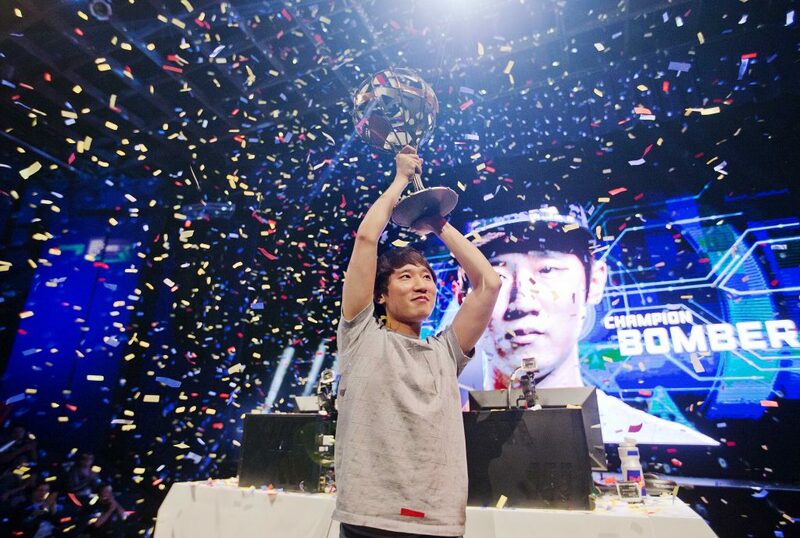 In some countries such as South Korea, eSports is nothing new. With dedicated TV channels broadcasting competitive gaming 24/7, eSports is very much a way of life, a viable career option and ultimately a reason to get up in the morning. Their national eSport champions are treated like rock-stars and inspire many fans to dedicate all their available time in training; to become the next eSports star. In contrast, within the western world, there have always been misconceptions surrounding the world of eSports. However, with established brands like FIFA introducing e-leagues to the masses, the mainstream inception of eSports in the west has begun. eSports is no longer just an environment for hard-core gamers, but rather an inclusive setting for all. So, what opportunities are out there? Not only is eSports growing exponentially as an independent market, but it’s also encouraging the convergence of more traditional industries. Established brands are joining forces with the games, entertainment, and media industries alike to head towards a common future. 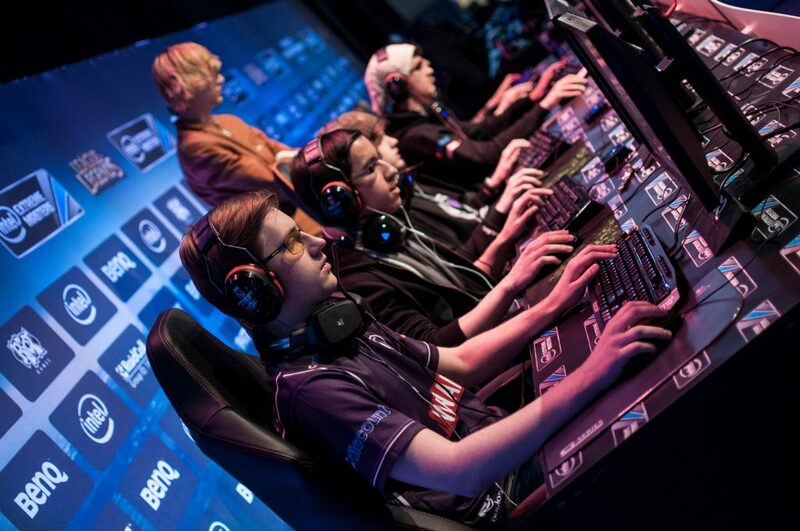 This future is designed to serve eSport’s main audience – the millennials. Whilst recent reports advocate that traditional sports are losing popularity amongst their younger fans, eSports is bearing witness to the complete opposite. Traditionally, millennials have been a hard audience to engage, thanks to their unconventional consumer behaviour habits (and ever-changing consumption of the digital narrative). eSports bridges this gap and provides opportunities for brands to connect with the millennial audience during their favourite past time; playing and watching video games. Sponsorship currently makes up a huge 38% of revenues from the eSports market. This is currently the largest revenue stream within the eSports market and boasts a year-on-year growth of +57.7%; hinting that the convergence has already begun. That being said, there are still many opportunities across other revenue streams too, including licensing merchandise (and the subsequent product lines), media rights and advertising. For example, revenues from ticketed spectator events also saw an increase; generating a revenue to the tune of over $32million in 2016 (up from $21million in 2015). At these events, merchandise and memorabilia give fans the chance to take home a piece of gaming history. Globally, ESL (Electronic Sports League), Blizzard, Riot Games and MLG (Major League Gaming) hosted the highest number of tournaments last year. From a licensee/ licensor perspective, there are growing opportunities to get involved in creating commercially viable product lines for brands such as these, with the future suggesting that sales will only increase. 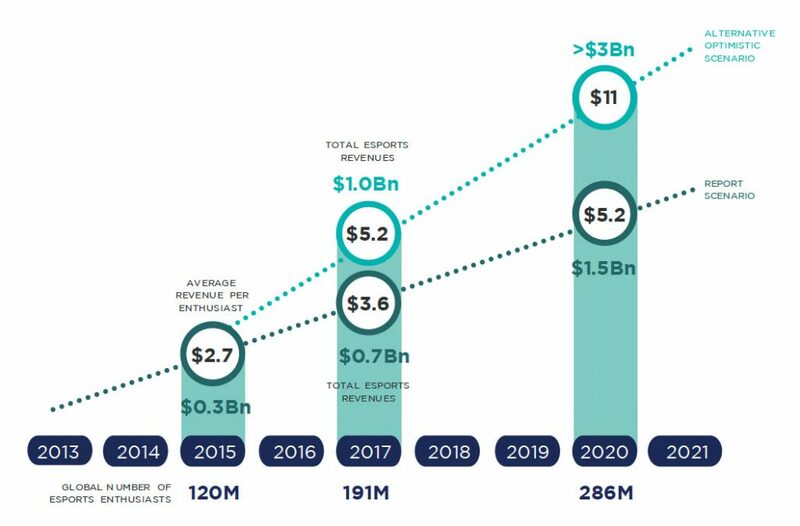 By 2020, the most prudent forecast for total eSports revenue is set at $1.5billion, with optimistic predictions suggesting that the total revenue could be as high as $3billion (as shown below). 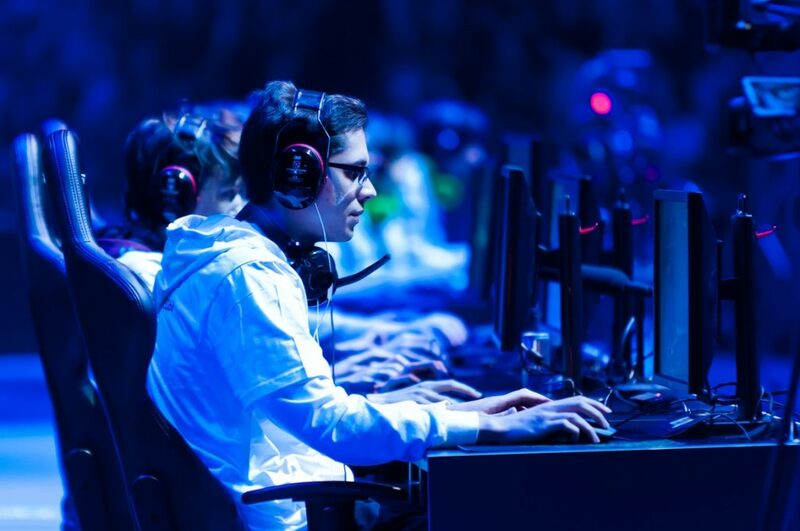 Although spending is currently still considerably less than traditional sports alternatives, the forecasted growth trends will aid in instilling a brands’ confidence in the future commerciality of eSports product. For the licensing industry specifically, the results of this forecast should be interpreted simply as the vastly expanding opportunity that it represents. As brands continue to push their brand-extensions and product to the consumer, licensees will be needed to create great product that resonates with the eSport fanbase. For licensees to really flourish though, Retail needs to get on board to help support these product applications. With big sporting teams such as the New England Patriots & the New York Mets officially announcing their investment in eSport teams (e.g. for The Overwatch league), new sub-brands are being created all the time. These sub-brands have added high consumer-exposure, thanks to their affiliation with these famous sporting giants. This, coupled with the fact that mainstream media behemoths such as ESPN and Turner are now broadcasting eSports tournaments, will only further drive sales. Like all sports, eSports is all about the augmented offering. Not only is it an opportunity for players to showcase their skills and ability, but it’s also home to a fully-fledged community of dedicated fans that want to share their passion and excitement towards a common interest. Spectators participate to play witness to the emotional roller-coaster associated with their team (or player), through both the ups and downs of each tournament. The affinity shared with eSports is something which simply isn’t going away – no matter who wins each tournament, eSports as a whole is just heating up. We couldn’t be any more excited to see what the future holds. Only time will tell how big-brands adapt to eSport’s transition from the unknown to the mainstream theatre. Either way, this is the perfect time to get involved with eSports and fully embrace the licensing opportunities available. Esports Market Report. (2017). Trends, Revenues, and Audience toward 2020. Available: https://newzoo.com/solutions/standard/market-forecasts/global-esports-market-report/ . Last accessed 13.07.17.